Some religions state that the very universe was created by words. The nation of America was founded using words. Words established the rights and freedoms this nation enjoys. The first of those rights is freedom of speech, which implies so much more than the right to use words. This anthology contains four stories from four authors. Each story pays tribute to either the ideals held by America’s First Amendment or to the concept that the words people use hold power. TW Iain creates a world where citizens only seek to hear the words of others rather than consider their own. Richard T. Drake crafts a world where a leader must speak for the underprivileged masses who simply can not speak for themselves. Heidi Angell tells of a world where humanity itself is dying, and a man strives to preserve what he can in hope that any who survive will have something with which to remember the world that was. M.L.S. 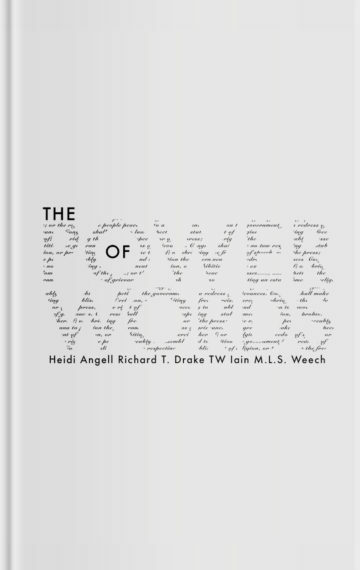 Weech brings to life a world where words were taken from society, and a mother plots to give those words back if only for her daughter to be able to speak. The word was the beginning, but it will never end.